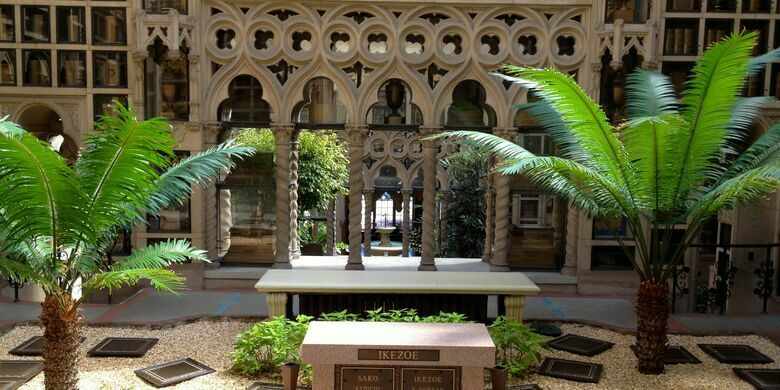 Join us for a guided introduction to the delightfully eclectic Chapel of the Chimes Columbarium in Oakland. We'll explore its labyrinthine architecture, filled with flowing fountains, verdant gardens, and gorgeous plays of light on stone. Considered by some to be architect Julia Morgan's masterpiece, the Chapel of the Chimes Columbarium opened modestly in 1909 at the end of Piedmont Avenue, near the Mountain View Cemetery and the end of the train line. Best known for her work on William Randolph Hearst's "Hearst Castle", Morgan was contracted in 1928 to expand and rennovate the building and she brought with her a team of artisans and her unique artistic, vision incorporating Spanish/Moorish and Gothic architectural elements, including antiquities imported from Europe. Showcasing a mix of architectural influences, surprising vistas and abundant natural light, the result is a place of final repose that is anything but spooky, and is instead in inspiring. The building, covering a block and a half of hillside, incorporates parts of the old train station (recognisable by its penny tile floor) and many other surprising details. More modern wings of the building feature massive retractable glass ceilings, mosaic-encrusted angels, Aztec-inspired motifs and enormous leafy trees. Join us for a special small group introduction, led by Chapel of the Chimes docents. Directions: Chapel of the Chimes is located at the end of Piedmont Ave, adjacent to Mountain View Cemetery. Although indoors, this walk covers a lot of ground including stairs. Bring water, your camera, and wear sturdy shoes! To help prevent no-shows, we are charging a $7 reservation fee. Please note that while this fee goes to help support Atlas Obscura and the Obscura Society so we can keep doing things like this, this is not a charge that goes to the Chapel of the Chimes, who have graciously provided this opportunity to us.